The Blue Train is unique - it is not merely a train, but combines the luxury of the world's leading hotels with the charm of train travel. Think of it as an all inclusive luxury rail cruise with an opportunity to view South Africa's spectacular landscapes and visit interesting tourist attractions along the way. Southern Africa has always attracted adventurous and romantic souls - discerning travellers who crossed the land in as much comfort as possible. But it was not until 1923, when the first deluxe train was introduced between Johannesburg and Cape Town, that truly luxurious train travel became a reality. The train with its distinctive sapphire-blue carriages, was known as the 'Union' Limited. However, people soon began referring to them as 'those Blue Trains' and so ...a legend was born. Although officially named The Blue Train in 1946, the train's enthusiasts trace its history to the 1890's and the discovery of diamonds and gold. The second generation train was completed in 1972. It became a symbol of luxury, sophistication and technological progress. Largely constructed by South Africans, the train incorporated the latest railway technology from Britain and Germany. But in 1995, after 25 years of service, the time had come to build a new Blue Train. On August 1st, 1997, the third incarnation of The Blue Train glided out of Cape Town station heralding a new era in the history of luxury train travel. On 5th October 1998, the second new Blue Train commenced from Pretoria. The Blue Train's suspension, braking, lighting and under-floor heating systems have been designed and customised with guests' comfort as the primary consideration, allowing them to savour the experience of a smooth, pleasurable ride. In ensuring that your experience is as reliable and sound as it is luxurious, safety and technical excellence are of paramount importance on The Blue Train. Every modern convenience, including a telephone service and a choice of digital entertainment channels, serves to make the journey all the more memorable. Beyond the technology, The Blue Train's reputation for comfort, excellent service, food, punctuality, Irish linen, crystal and silverware in the heart of some of the world's most rugged and spectacular scenery, soon spread around the world. As the sky darkens over the landscape, the day's smart-casual dress code gives way to a parade of elegant evening wear or traditional attire, in keeping with The Blue Train's classic livery and earthy African décor. The chefs create menus to tantalise your palate, preparing dishes using the freshest, local ingredients. Ostrich, venison, Karoo lamb, Knysna oysters as well as other award-winning Cape produce are skillfully presented in delicate crystal or on fine china, all contributing to the ultimate experience. 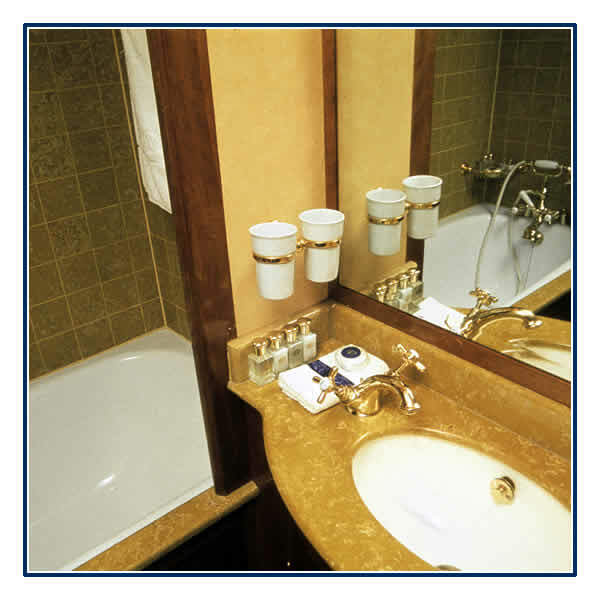 This unique luxury recreation and business experience takes you where you want to go in an endless, five-star splendour. It pauses only to pick up prestigious World Travel awards for being a cut above the rest and the Diner's Club accolade for its connoisseur selection of South African wines. 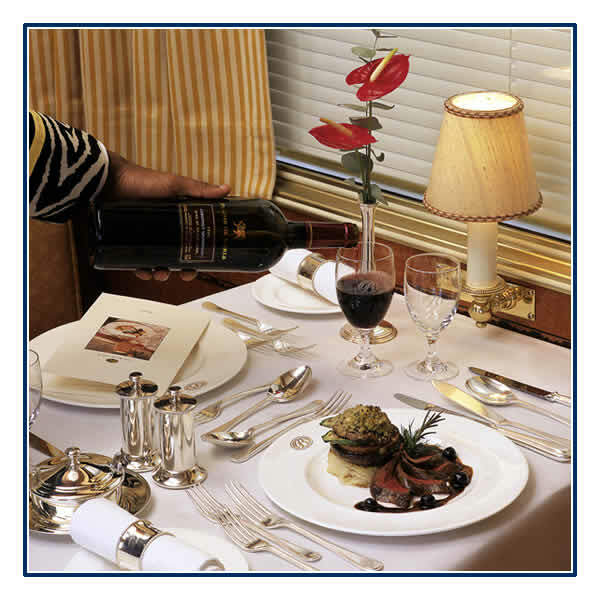 The Blue Train cuisine puts sheer good taste on a plate while butler personal attention puts you on a pedestal.